Aside from your feed, your bids are the most important part of your Shopping campaigns. They play a key role in determining what queries you show up for and how profitable your campaign is over all. Bid too much and you’ll kill your efficiency. Bid too little and you’ll never gain any traction. You don’t have to be a mad scientist or a mathematician to effectively bid for your Google Shopping campaigns. But, you will need some tips, some strategy, and some practice. So how do you find the sweet spot in the middle? How do you show up for the right search queries, close sales, and generate a return on ad spend you can brag about? Getting the optimal bid is a moving target, but here’s how you can get started and work toward profitability. Product Price - All the time we see merchants with campaigns where they have the same bid for all of their products. So a $1.35 box of screws has the same bid as a $350 engine. Not a good idea. Profit Margin - Product price alone can’t determine how you bid, though. You have to take into consideration your average gross margin. I recommend keeping this simple and just looking at price - cost of goods sold rather than looking at a true profit margin. After all, you are just trying to bid intelligently, not prepare your taxes. eCommerce Conversion Rate - Finally, you want to look at your average conversion rate. Take into consideration that your conversion rate from paid search is often going to be lower than your site average. Taking those three numbers into consideration, here’s the formula we use to determine your MAX bid. Once you know your MAX, you can scale down from there. Your conversion rate for paid traffic is usually going to be less than your site average - Sometimes it’s on par, but remember that direct visitors and those who search organically for your name, convert at a higher rate. Often paid traffic will convert at 10-30% lower rates than your site average. So if your site average conversion rate it 1.00% then your paid traffic conversion rate may be closer to .70 - .90%. This isn’t always true. 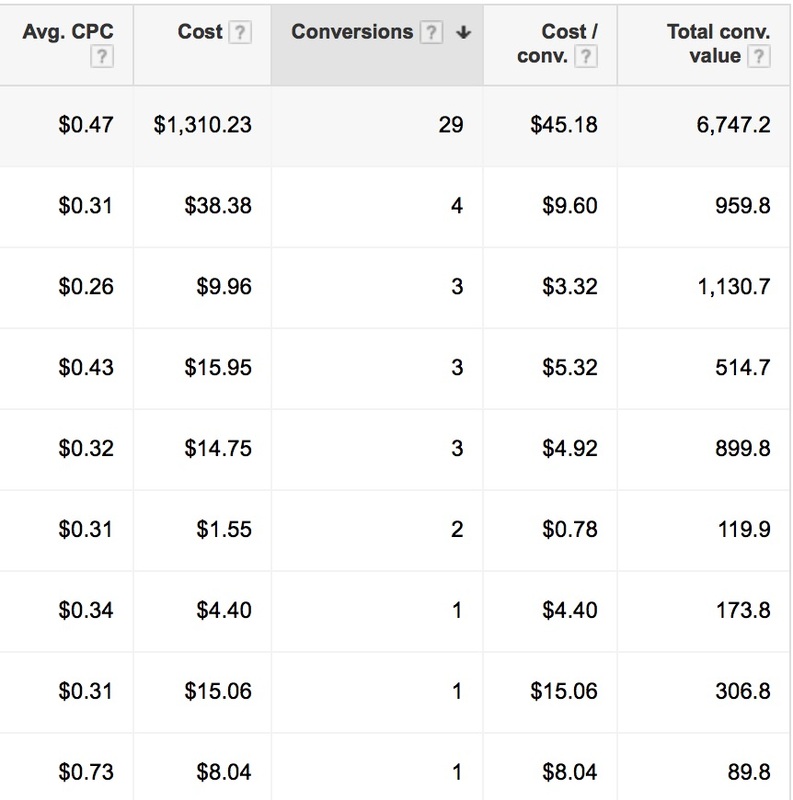 We see some products in Google Shopping convert at 2-3x a site’s average. In the beginning you won’t know which products will perform well, though, so it’s usually better to be conservative initially. You may want to bid less initially - Remember this calculation determines your max. We will often take this and cut it in half initially for our bid; especially if the max CPC following this is north of $1.00 I would almost always suggest bidding less initially. Often when you first launch your campaign you’ll need to increase your bids a few times to start gaining impressions and clicks. Don’t be afraid to bump your bids incrementally over the first few weeks. If your ads aren’t getting impressions or clicks and you’re confident in the quality of your feed, then likely you need to bid more. I suggest bumping bids slightly - $.03 to $.10 at a time until you start getting impressions and clicks. It’s very rare for a shopping campaign to hit its daily budget in the early going. In the beginning stages of your campaign Google will show your PLAs more conservatively and watch how users respond to them. As your performance metrics improve over time (namely your CTR), Google begins to show your ads more frequently for relevant queries. It’s important to set a budget that gives your campaign room to grow. If your average bid is $1.00 and your daily budget is only $5.00 Google know that 5 clicks at your max CPC will wipe out your budget. This makes Google less likely to show your ads, especially if your delivery is set to standard instead of accelerated. Standard delivery means Google will show your ads evenly throughout the day to make your budget last. Accelerated delivery means Google will show your ad whenever it’s eligible to show as quickly as possible. I recommend accelerated delivery. The most important thing initially is getting impressions and clicks and finding out what works. Here are some helpful tips for low bids vs. high bids. Obviously everything is relative. For a $10 item I would consider a $.20 bid to be really high. For a $500 product maybe a $2.00 bid would be on the high side. Like I mentioned before, margins and conversion rates are also a factor. Lower bids usually = longer tail keywords - Usually lower bids lead to exposure for longer tail and less competitive keywords. So the keyword “business cards” will command a higher CPC than “14 pt high gloss 4/4 business cards”. The interesting thing is that usually the longer queries will convert better. Also, with lower bids your budget goes further. So, sometimes lower bids = more traffic and more conversions. Higher bids for good position, branding, awareness, and competitive terms - Sometimes the keywords that convert are the really competitive ones that cost more. Or there are times when you want exposure for a particular product and immediate ROI is secondary to exposure. Let’s say you launch a new BBQ grill and you want it to show up for various BBQ grill keywords. You might bid more and focus more on impressions and clicks rather than immediate conversions. Especially if you have a remarketing campaign in place or have an email follow up system in place. Performance bidding - Is a product selling? Bump the bid slightly. Why? To see if you can get more exposure for more keywords and sell more. Is a product getting clicks but not selling? Reduce the bid as maybe you are showing up for competitive, non-buyer keywords. Or, check the page and the competition. Maybe your landing page needs some conversion optimization, or maybe your price is too high, or your competitor is running a promotion. Seasonal bidding - CPCs are mainly driven by competition, meaning more competitors bidding will increase max CPCs. For seasonal products like plants, holiday decorations, sporting equipment, back to school supplies, snow gear, beach attire etc, you’ll need a seasonal bidding plan. Some seasonal products will sell year-round but in smaller quantities and at lower bids in the off-season. Have your products segmented in a way that will allow for easy increases and decreases in bidding depending on the season. Bidding for Google Shopping is not a “set it and forget it” process. Competition, seasonality, business goals, and product performance are all moving targets. Your bids will need to go up or down depending on those factors and more. How Often Should You Update Bids? Initially 1-3x per week for the first month is what I recommend - If you discover that you bid too low initially and you need to start incrementally bumping bids, then making changes every few days is fine. Take into consideration that weekends, for a lot of businesses, are not accurate reflections of performance. If you make bid adjustments right before or during the weekend, you’ll probably want to let them ride for a few weekdays to accurately see how performance is impacted. Then weekly for feeds over 50 products - Once your shopping campaigns are running profitably, then adjusting bids on a weekly basis, based on performance should be fine, depending on your overall volume. For our clients with hundreds of products and spending north of $5,000 to $10,000 per month we checking performance daily and then making bid changes a few times per week rather than just once per week. 1-3x per month for feeds under 50 products - For smaller product feeds you should check in weekly, but likely you’ll only be adjusting bids 1-3x per month. Forming tight product groups will help tremendously when managing bids and watching performance. One of the biggest keys to success with Google Shopping campaigns is to see what’s working and what’s not and then adjusting accordingly. If you have more than a handful of products, you’ll need to group your products in a way to make it easy to track performance and make changes. 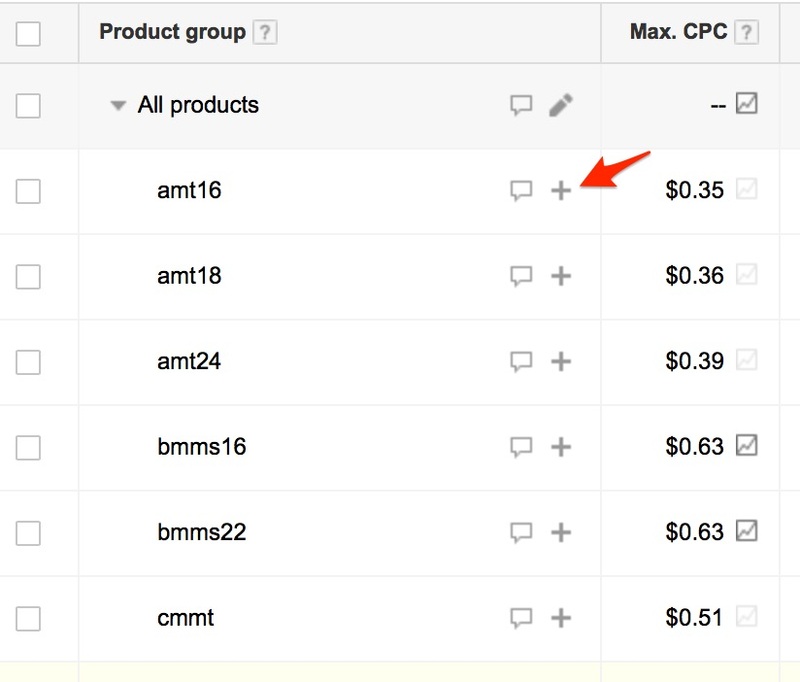 In AdWords, click on your Google Shopping Campaign, then click on your Shopping Campaign Ad Group. While it’s possible to have just one Ad group in your Shopping Campaign, it’s often recommended to have multiple Ad Groups for easier management. Clicking on the Ad Group name will take you to the product group area where you can divide and subdivide your products into groups. Just click the plus sign next to a current group to subdivide further. You have several options on how to divide your products including: brand, category, product type, and custom label. Brand - This is self explanatory, but you can subdivide your products by brand to make it easier to watch performance and adjust bids. This puts all products made by a certain brand into a group. When you click the drop down arrow next to the brand name you can see the individual products within that group. You can also see the metrics for each product including impressions, clicks, click through rate, conversions and more. Category - This is based on Google Product Category. These categories are pretty broad and may included a lot of products in your feed in one category. This doesn’t provide the best structure for granular management, in my opinion. Custom Label - You can give products in your feed up to five different custom labels. This is where you might add labels like “top seller”, “back to school”, “Black Friday”, “Snowboarding Gear” or something else helpful. These labels are used for quick reference and segmentation for bid management. Product Type - This is based on the product type that you specified in your feed and is usually based on your site taxonomy or category breadcrumbs. This is a great way to segment products as this will mirror your site in terms of product categorization. This is my favorite bidding approach, but to do it correctly takes some work. Looking at the segmentation above you might have one brand or category that performs really well, but inside of that brand or category will be multiple products, some likely doing really well, and others hogging budget with no sales to show for it. The best way to truly maximize your return with shopping campaigns is to create unique bids by SKU and optimized based on performance. Whether you have your products grouped by brand, category, product type, or label, you can click on the drop down arrow next to the product group name to see all of the products contained in that group. Then you can see performance by SKU. We like to hold each product accountable and treat it like it’s own business unit. If one particular product isn’t generating sales to assisting in sales, we cut the bid. 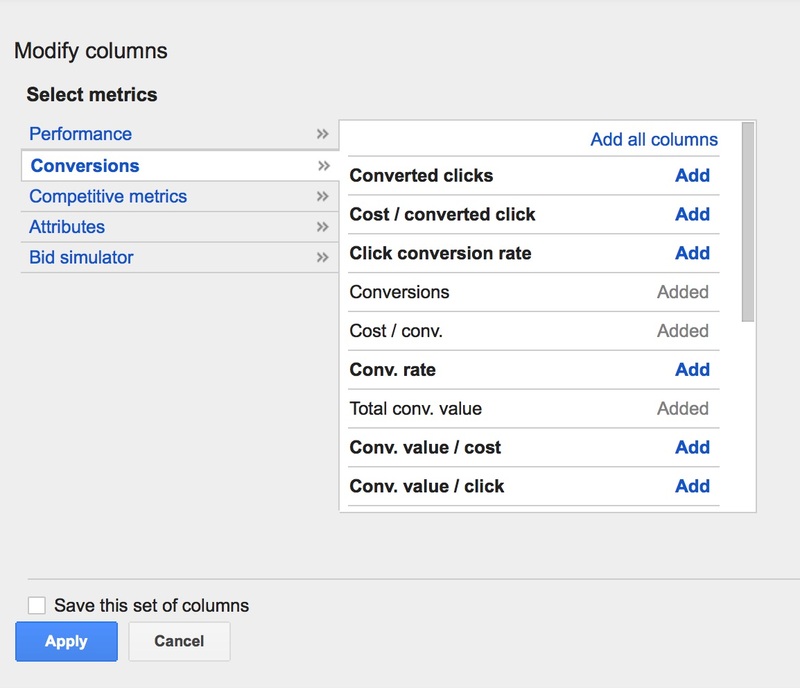 To see conversion metrics you’ll need to click on the Columns drop down, then click on the arrows by Conversions to add the conversion metrics you want to see. What if you could bid differently for your best customers? What if you could tell Google, “when you see a searcher like this - I want to bid more.” Say, for example, that someone has been to your site before and made a purchase. Now they are back at Google searching for a product that they don’t know you offer. Would you bid more for them than you would for a prospect you know nothing about? I would. 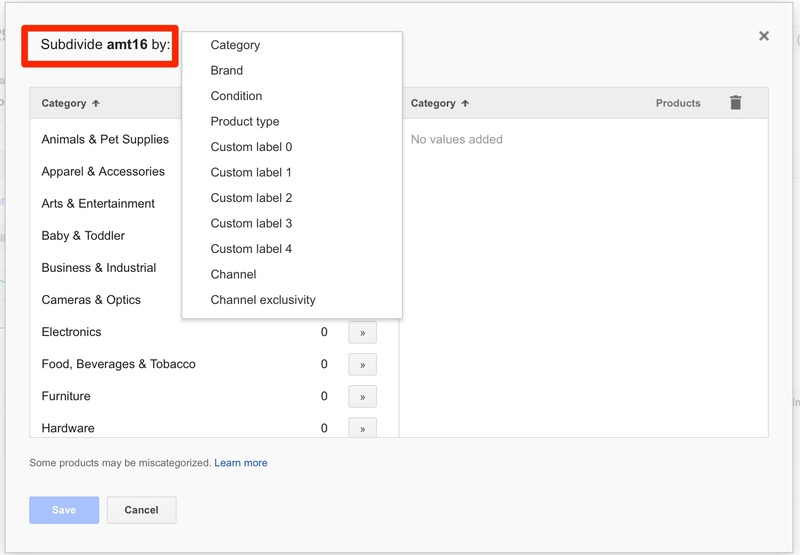 Remarketing Lists for Search Ads or (RLSAs) are now available for Google Shopping ads. When first introduced, remarketing only applied to display ads. Site owners would drop a pixel in the browser of visitors to their sites and then follow those visitors around the web later with ads trying to entice them back to make a purchase. Some advertisers don’t know that you can also use remarketing for search ads. This program has been open for a while now for text ads. However, RLSAs currently in beta so to take advantage of it, you will have to call Google Adwords support at 866-246-6453 to be enrolled. You will also need to add a remarketing tag to your site or use Google Analytics to enable remarketing. If you use Google Analytics you will need might need to update your tracking code slightly. See this Google help article for assistance. All Visitors - to get a list of anyone who's visited your site before. Abandoned Cart - for visitors who add something to their cart and leave without buying. Product Viewers - those who got to a product product page on your site. Previous Buyer - those who have purchased before. This list type allows you to upload your customer email list to Google for them to “match” against their users. You can then target these users in a variety of ways and with different channels from search, to display, to YouTube, and Google Shopping. These lists can be useful in helping you target customers who’ve bought from you in the past, but may be searching on Google for another product they don’t know you sell. Or maybe they’ve purchased from you in the past, but can’t remember your url or name (it happens). Using a Customer Match lists allows you to bid more aggressively when someone on your list is searching for products on Google. One of the best reasons to upload your customer list is so you can create a Similar Audience. Similar Audiences are a great list type Google now offers. This is where Google creates an audience that is similar in search behavior to your other remarketing lists. So you can create an audience that is similar on search behavior to your customers (similar to Customer Match), or similar to all visitors or any of your other remarketing lists. This allows you to bid more aggressively when someone behaves like your best customers. If you have any video content on YouTube, you might also consider using YouTube lists for targeting. You can often target users who subscribe to your YouTube channel and/or those that have viewed a particular YouTube video.